The below analysis is based on 2017 Uniform Data System (USD) reported by health centers (both 330 funded and Look Alikes). Performance on Clinical Quality Measures is derived from Tables 6B and 7 (with the exception of the Prenatal and Birthweight measures). Telehealth Use is from Question 2 of the UDS’s Other Data Elements form, which asks Did your organization use telehealth in order to provide remote clinical care services [in 2017]? Yes or No. 1. Names used for the quality measures shown here are colloquial, and do not reflect exact names used in the 2017 UDS Manual. 2. Measures are shown in alphabetical order, not in the same order as the UDS Manual. 3. The Diabetes measure is calculated as Controlled, as opposed to Uncontrolled, as is reported in the UDS. This was done for comparison purposes, so all measures are ‘better’ if higher. Health centers that report using Telehealth, on average, report slightly higher performance on all clinical quality measures than those that report that they do not use telehealth. 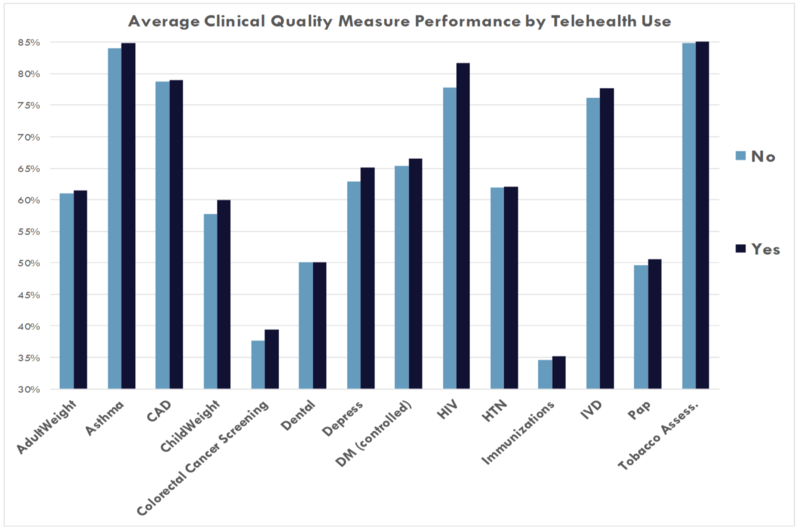 On average, across all measures, using telehealth is correlated with a 1.18% percentage point higher performance rate per clinical quality measure. A chart showing all measures side-by-side can be seen below. Download the full analysis document at the bottom of the page for details about each measure.